The Anton Bauer Digital 90 Gold Mount Battery utilizes an enlarged honeycomb interior to improve airflow and heat dissipation. This not only makes it more reliable while extending its lifespan, it also prevents a single faulty cell from causing the remaining to become unstable. It has a thermal cutoff that triggers the battery to shut down if it gets too hot or cold, an algorithm to prevent power surges often referred to as “ringing,” and improved capacity estimation. And there’s a built-in D-tap for all of your accessory needs. This 14.4V, 93Wh battery offers 10 amps of continuous power load, making it stable for power-hungry cine cameras that require a constant minimum. Additionally, it’s output is perfectly suited for Gold Mount-accepting LED lighting. 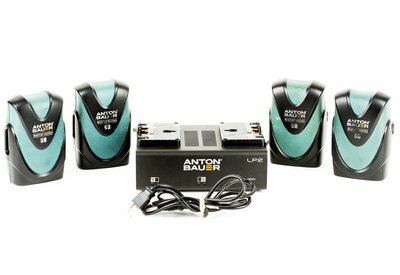 The Anton Bauer LP2 Dual Gold Mount Battery Charger is a compact “smart charger” designed and optimized for the Anton Bauer Digital 90 Gold Mount Battery. The LP2 offers the same simultaneous, multi-chemistry charging that allocates the most power to the highest-charged battery. Using a feature AB refers to as InterActivity, the charger communicates with the battery and assigns the best charge routine possible based on the battery’s cell chemistry. Anton Bauer also touts the Performance Series / LP2 chargers as being 40% more efficient.